Online battles got a little hotter with the release of Relic Raiders on Steam Early Access. The free-to-play multiplayer action game drops up to sixteen players into randomly generated arenas where they must fight until one remains. Players choose from six characters that specialize in melee, ranged, or area-wide attacks. However, characters such as Aria offer a balanced selection of abilities. Other characters include an agile ninja, a cybernetically-enhanced black bear, a time-bending sniper, a guy in a power suit with big guns, and a crazed robot assassin. As a top-down shooter/fighter with a battle royale mode, Relic Raiders dives straight into the action. 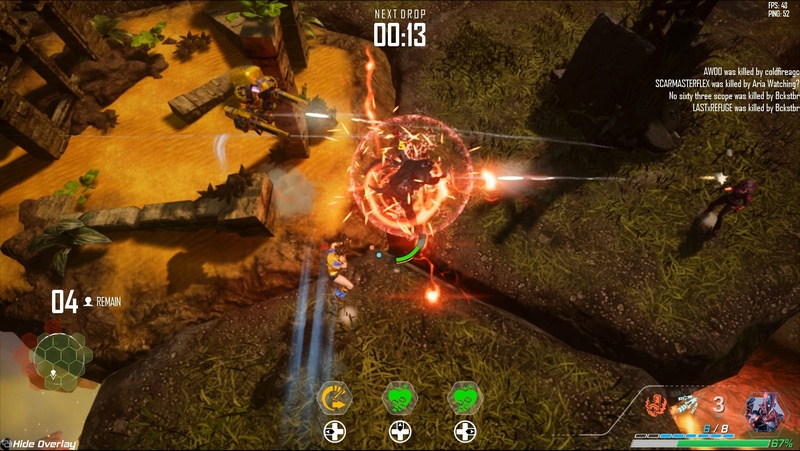 Players will need to learn when to dash, jump, block, and shoot, but it doesn’t take long to get the hang of the controls. Just knowing half of them is enough to begin fighting. At the start of a match, competitors must race across the hexagonal tiles to either find opponents or break open giant containers with single-use power-ups inside them. Each character can hold three power-ups at a time. These items can increase speed, create a wall to keep players from leaving or entering a tile, regenerate health, and more. ram others off the map with, a body slam, and a heavy kick. She can also charge up her primary weapon for extra damage. All the while, the map gradually shrinks, with a countdown timer showing when groups of tiles break apart before dropping away. This helps ensure that matches are usually between five to ten minutes long. That way, you can get in a few matches without having to set aside hours to play. maneuver around each other. Ranged characters may initially seem like they have the greatest advantage, but melee characters usually have the ability to pin down opponents to keep them still long enough to get in a few good hits. complements the short game sessions. 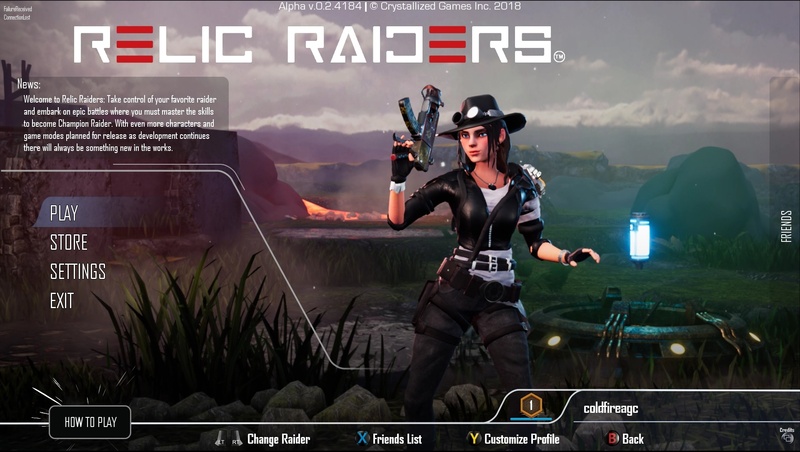 Although battle royale is the currently the game’s only playable mode, the developers are working on “Raider Mode,” which will be a team-based mode that combines elements of Capture the Flag with King of the Hill. Six more characters are also in the works, which will bring the total to twelve. Although players may need to earn points to unlock access to some of these characters, in-game purchases will be limited to cosmetic items such as skins, taunts, and sprays. Other features and improvements will be added as the Early Access phase continues. 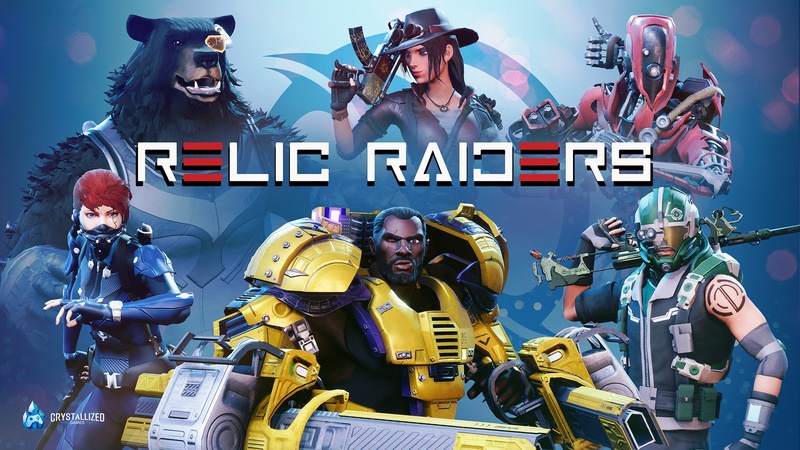 Visit the official Relic Raiders website for more information or download the free-to-play the game from Steam to dive straight into playing.